Intra-city Relocations of Major League Baseball teams since 1989. Graphic by author. So, what was this map with the oracle-like ability to answer the big question, “Why are the Braves moving to Cobb County?” It is a basic dot map published at homeofthebraves.com, a website created to rationalize the Braves’ relocation and to publicize emerging details about the new stadium project. 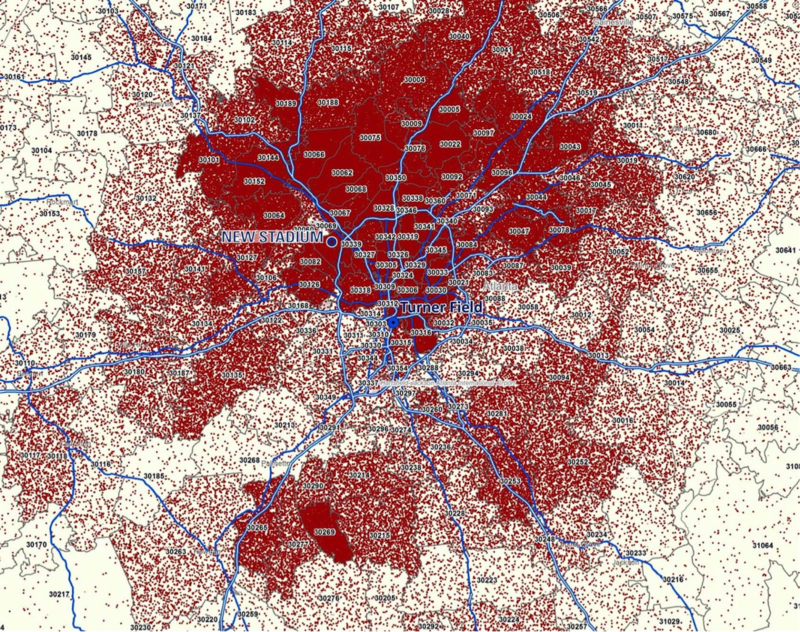 According to one of the map’s captions, “Each dot…represents a ticket sold to a Braves’ game in 2012.” The map shows a clear spatial pattern. A wide-angled feature resembling a bouquet of flowers, its bundled stems perching near the city’s center and flowers fanning out 25-30 miles to the north of Turner Field, indicated that most Braves ticket purchasers lived in the northern reaches of the metropolitan region. The map also showed the spatial relationship between the two stadiums and these ticket purchasers—Turner field down by the stems and the new stadium tucked among the flowers of the bouquet. Several basic cartographic questions arise from the map. Does each red dot represent a single game purchase? How are season tickets represented? What about cash purchases? What about multiple purchases from the same address? And how are ticket purchases actually located on the map? By ZIP code areas which are shown on the map? And, if so, then how are they located within the boundaries of these areas? The purpose of this essay is not to answer these technical cartographic questions. Instead, I examine the performative effect of the map—the ways in which it has acted (or worked) to shape public understandings of the Braves’ relocation and the ensuing discussion of that plan, and ultimately the role it played in altering the geography of the city itself. Or, as map scholar Denis Wood construes it, “The factuality of a map is a function of the social assent granted to [and the collective social energy channeled by] the map’s proposition…that this is there.” 17 Acknowledging this “cartographic problematic” (real ↔ representation), allows us to understand that maps do “actual work” in the urban process. 18 What is of interest here, then, is not what urban features the Braves’ map of ticket purchases reflects but those it creates. The ticket purchases map was essential to a key argument made by the club in the initial rollout of its stunning plan. On the morning the plan was revealed, the Atlanta Braves issued a video statement by club president John Schuerholz in which he declared, “this new ballpark will be in the heart of Braves Country.” 19 At the same time, on the website homeofthebraves.com the map of ticket purchases was published over a caption that read, “The new stadium will be situated in the heart of Braves Country.” 20 To make this specific claim about Braves Country was to assert that the team’s relocation would be an utterly sensible, if not natural, geographical change. And convincing the public of that entailed providing an authoritative answer to both an existential question (that Braves Country exists) and a spatial one (that the new stadium will be in the middle—heart—of it). And this required a map. 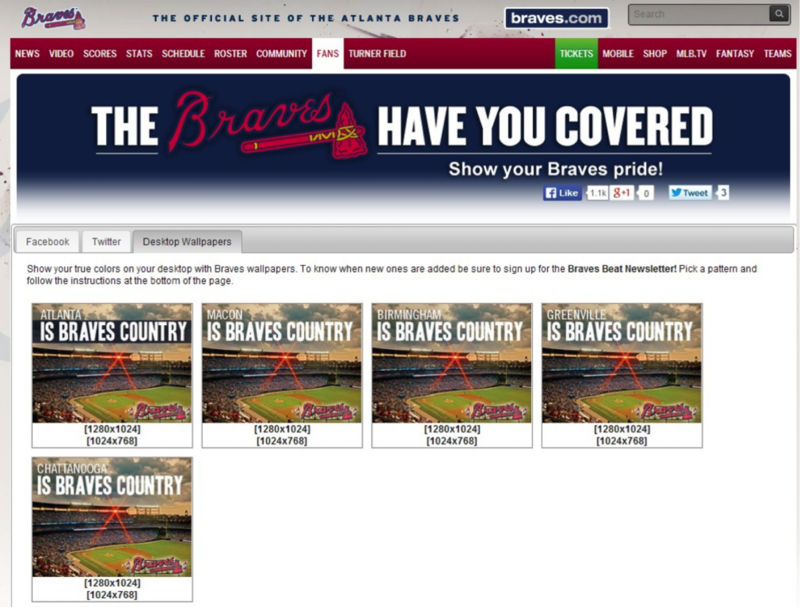 The map of ticket purchases published on November 11, 2013, did not invent Braves Country. 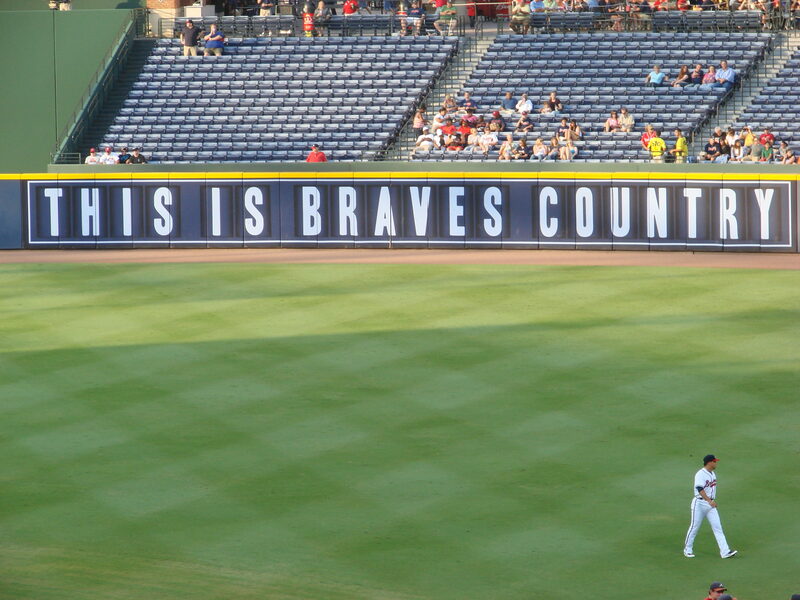 The notion of Braves Country has been around for some time and had long been referenced with regularity by the club and fan groups, as well as the media. If, as King suggests above, knowing a “country” entails knowing a map, then earlier mappings of Braves Country should have existed prior to November 11, 2013. Image courtesy of Flickr user Sarah McKagen, used under a CC-BY-SA license. And indeed there were many, and one common feature of these maps is that the “country” they conjured extended well beyond the metropolitan area. 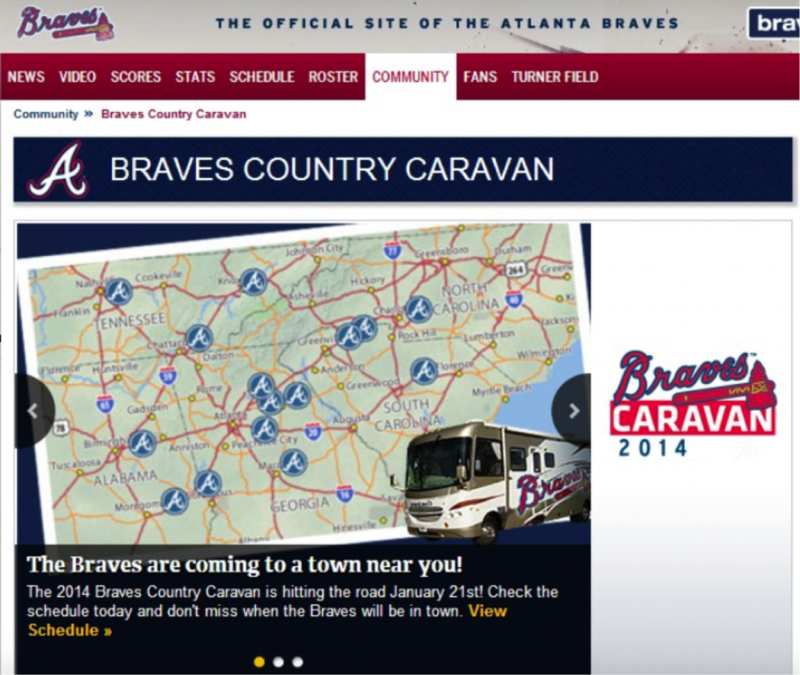 A typical example is the map created to publicize the Braves Country Caravan, an annual off-season tour taken by selected players and team personnel across the team’s “home” territory. The regional scale depicted in such maps was reinforced by other official spatial representations, such as downloadable “wallpaper” for desktop computers signifying major cities in Alabama, South Carolina, and Tennessee, and elsewhere in Georgia, as within the boundaries of Braves Country. It is clear that the map of ticket purchases provided a convincing explanation of the team’s dramatic plan to relocate to northern Atlanta and brilliantly enabled readers to affirm with utter certitude the sensibility of it. But maps, as critical cartographers argue, “are in a constant state of becoming.” 29 The ink used to draw a map may be fixed permanently (more or less) on the page by the cartographer, or in this case, as digital information embedded in a jpeg or pdf file, but the meanings it conveys are not. “Maps are never fully complete,” write geographers Del Casino and Hanna, “nor are they ever completely inscribed with meaning through production [by the cartographer]. Rather, consumption is production.” 30 In other words, map reading is always an act of map production. The meanings of any map emerge and re-emerge as it is read by differently situated people in particular political, social, historical, and geographical contexts. And these different readings often challenge and destabilize what seem to be settled, obvious, and even natural, meanings. Essentially, new maps are produced without changing a material (or digital) thing about the map itself. In this reading, the map shows the historical and spatial relations that have always constituted the “new” Braves Country—the sacrifice of poor, mostly non-white residences for the city’s expressway network and its major league stadium, both of which enabled a northern fanbase to develop. For Phyllis the map reveals not the dislocation of a team from its loyal fans but an urban geography of wealth (in the north) and poverty (in the south) produced by historical and political processes in which the Braves themselves have been complicit. Thus, contrary to the popular and seemingly intended interpretation of the ticket sales map, this counter-interpretation proposes to open the discussion, not foreclose it, about the connections between the physical spaces required for professional baseball (stadiums, roads, parking lots, etc.) and the uneven social and spatial distribution of costs and benefits of developing them. 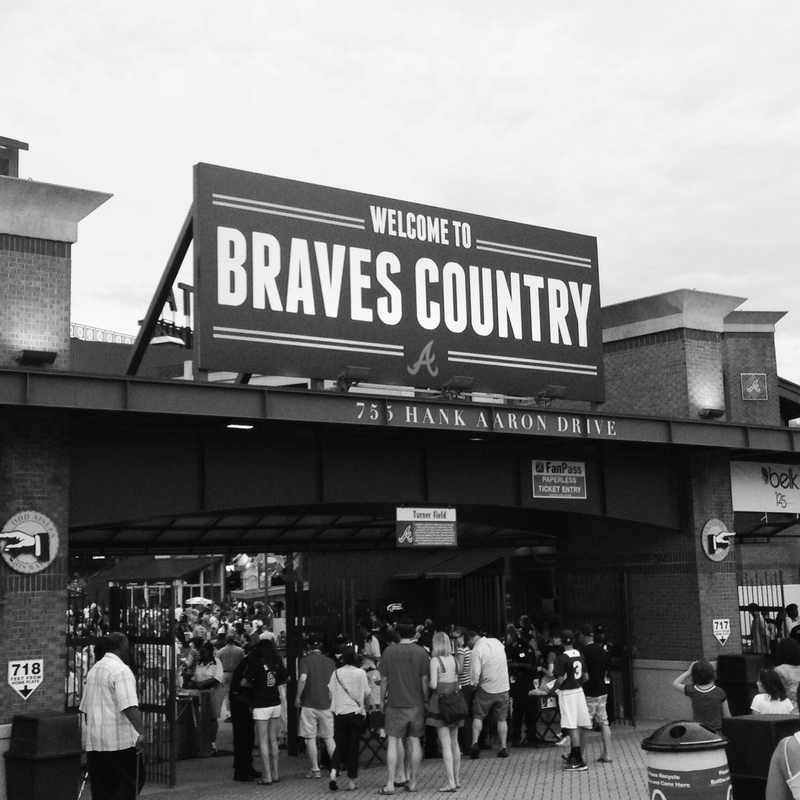 The purpose of this essay was to examine the Braves map’s role in shaping public and media reaction to, and analysis of, the team’s plan to relocate to northern Atlanta. Overwhelmingly, the evidence is strong that in the months following the relocation announcement it did this. In doing so, the map did “actual work” that went beyond the representational. 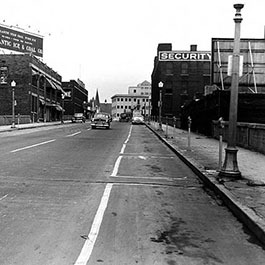 It socially demarcated the city, re-differentiated its spaces, and created new spatial identities in relation to the club (central city vs. northern edge cities as Braves Country). In the end, by strategically re-territorializing “Braves Country,” the map effectively created new urban subjects (Braves fans “here” and not “there”) and, thus, a new city. Courtesy of Flickr user J Hikka, used under a CC-BY-NC-ND license. 3. ↵ Reuben Fischer-Baum, “How the Braves’ Atlanta Exodus Compares with Other MLB Moves,” Deadspin, November 11, 2013, accessed June 12, 2015, http://deadspin.com/chart-how-the-braves-atlanta-exodus-compares-to-other-1462494338. 5. ↵ Larry Keating, Atlanta: Race, Class, and Urban Expansion (Philadelphia: Temple University Press, 2001); Clarence Stone, Regime Politics: Governing Atlanta, 1946-1988 (Lawrence, KS: University Press of Kansas). 6. 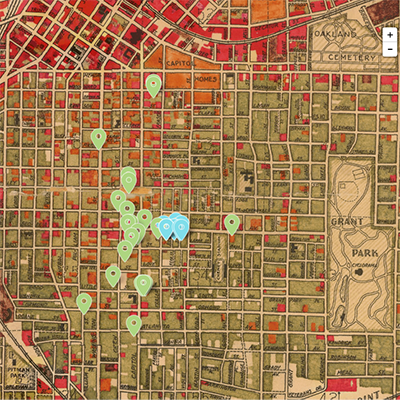 ↵ Joseph Hurley, “How a Densely Populated Neighborhood Became Turner Field: A Map Essay,” Selections from the University Library Blog, Paper 9, Georgia State University, accessed June 12, 2015, http://scholarworks.gsu.edu/univ_lib_blog/9/. 7. ↵ Joel Garreau, Edge City: Life on the New Frontier (New York: Anchor Books, 1992); James Howard Kuntsler, The City in Mind: Notes on the Urban Condition (New York: The Free Press, 2003). 8. ↵ Atlanta Braves, “Atlanta Braves Secure Land for New Stadium and Integrated Mixed-Use Community,” November 11, 2013, press release, accessed June 12, 2015, http://atlanta.braves.mlb.com/atl/downloads/suntrust-park/announcement-release-111113.pdf. 9. ↵ Reid Wilson, “Why the Braves are Leaving Atlanta, in One Map,” Washington Post, November 11, 2013, accessed June 12, 2015, http://www.washingtonpost.com/blogs/govbeat/wp/2013/11/11/why-the-braves-are-leaving-atlanta-in-one-map/. 10. 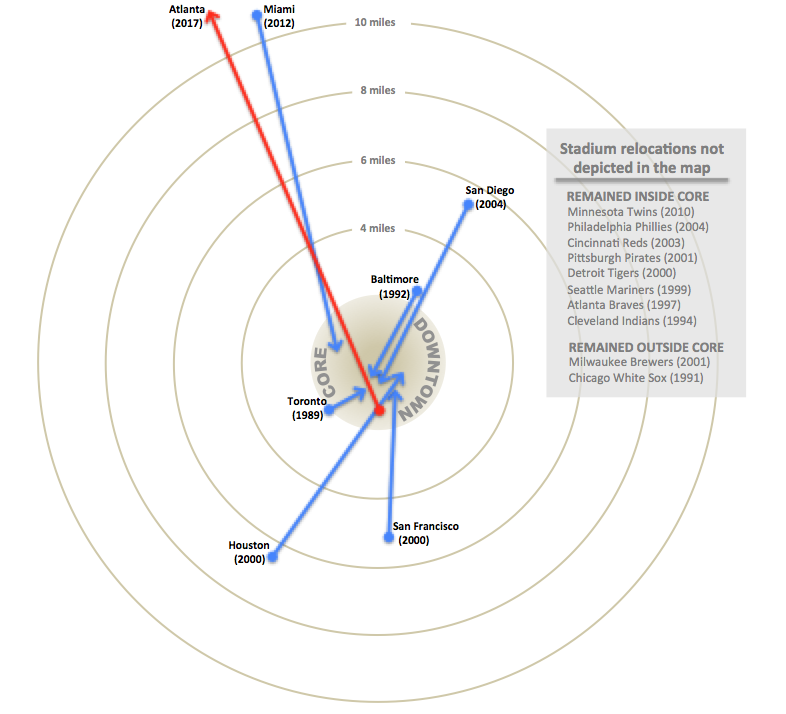 ↵ Ted Berg, “Why the Braves Want to Move, in One Ticket-Sales Map,” USA Today, November 11, 2013, accessed June 12, 2015, http://ftw.usatoday.com/2013/11/why-the-braves-want-to-move-in-one-ticket-sales-map. 11. ↵ Kumar, November 11, 2013 (11:04 a.m.), comment on ESPN.com News Services, “Braves: Moving to Cobb County in ’17,” November 11, 2013, accessed June 12, 2015, http://espn.go.com/mlb/story/_/id/9959440/atlanta-braves-leaving-turner-field-relocating-cobb-county-2017. 12. ↵ Ryan, November 11, 2013, tweet from @ryuro_, accessed June 12, 2015, https://twitter.com/ryruro_/status/399917327149694976. 13. ↵ Jeremy Crampton, Mapping: A Critical Introduction to Cartography and GIS (Oxford and New York: Wiley-Blackwell, 2010); Denis Wood, Rethinking the Power of Maps (New York City: Guilford Press, 2010). 14. ↵ John Pickles, A History of Spaces (London and New York: Routledge, 2004), 31-32. 15. ↵ Wood, Rethinking the Power of Maps. 17. ↵ Wood, Rethinking the Power of Maps, 52. 18. ↵ Ola Söderström, “Paper Cities: Visual Thinking in Urban Planning,” Cultural Geographies 3 (1996): 252. 19. ↵ John Schuerholz, “Braves announce new stadium,” video statement, November 11, 2013, accessed June 12, 2015, http://m.mlb.com/atl/video/topic/8878972/v31217351/braves-announce-plans-for-a-new-ballpark. 20. ↵ The map was initially published on several pages of the homeofthebraves.com website and above several different captions, including this one. 21. ↵ David Delaney, Territory: A Short Introduction (Oxford and New York: Blackwell, 2005): 19. 22. ↵ Wood, Rethinking the Power of Maps, 52. 23. ↵ Geoff King, Mapping Reality: An Exploration of Cultural Geographies (London: MacMillan, 1996): 16. 24. ↵ Kumar, November 11, 2013 (11:04 a.m.), comment on ESPN.com News Services, “Braves: Moving to Cobb County in ’17,” November 11, 2013, accessed June 12, 2015, http://espn.go.com/mlb/story/_/id/9959440/atlanta-braves-leaving-turner-field-relocating-cobb-county-2017. 25. ↵ Voice of Raisins, November 11, 2013 (3:04 p.m.), comment on Gil Elliott, “The Players May Change but the Game Remains the Same,” Braves and Stuff, October 22, 2013, https://bravesandstuff.wordpress.com/2013/10/22/124-the-players-may-change-but-the-game-remains-the-same/. 28. ↵ Michael, November 11, 2013 (1:54 p.m.) comment on ESPN.com News Services, “Braves: Moving to Cobb County in ‘17,” ESPN, November 11, 2013, accessed June 12, 2015, http://espn.go.com/mlb/story/_/id/9959440/atlanta-braves-leaving-turner-field-relocating-cobb-county-2017; The Dodgerharter, May 5, 2014 (2:54 a.m.), comment on Andrew Baggarly, “Shame on Braves for Using Turner Field Like Disposable Diaper,” May 5, 2014, accessed June 12, 2015, http://www.csnbayarea.com/giants/shame-braves-using-turner-field-disposable-diaper; Will, November 11, 2013 (4:26 p.m.), comment on ESPN.com News Services, “Braves: Moving to Cobb County in ‘17,” ESPN, November 11, 2013, accessed June 12, 2015, http://espn.go.com/mlb/story/_/id/9959440/atlanta-braves-leaving-turner-field-relocating-cobb-county-2017. 29. ↵ Rob Kitchin, Chris Perkins, and Martin Dodge, “Thinking About Maps,” in Rethinking Maps: New Frontiers in Cartographic Theory, edited by Martin Dodge, Rob Kitchin, and Chris Perkins (London and New York: Routledge, 2007), 20. 30. ↵ Vincent J. Del Casino Jr. and Stephen P. Hanna, “A Methodological Intervention for Interrogating Maps as Representational Practices,” ACME: An International E-journal for Radical Geographies 4 (1), 50. 31. ↵ Rebecca Burns, “The Other 284 Days,” Atlanta Magazine, June 21, 2013, accessed June 12, 2015, http://www.atlantamagazine.com/great-reads/turner-field-development/. 32. ↵ Christopher, November 11, 2013 (12:32 p.m.) comment on ESPN.com News Services, “Braves: Moving to Cobb County in ‘17,” ESPN, November 11, 2013, accessed June 12, 2015, http://espn.go.com/mlb/story/_/id/9959440/atlanta-braves-leaving-turner-field-relocating-cobb-county-2017. (emphasis added). 33. ↵ Phyllis, December 10, 2013, comment on Maria Saporta “Questions of MARTA and transit get ignored in Cobb-Braves stadium plans.” SaportaReport December 9, 2013, accessed June 12, 2015, http://saportareport.com/questions-of-marta-and-transit-get-ignored-in-cobb-braves-stadium-plans/.